Update 3/16/2012: This American Life has now retracted the entire episode because they discovered that Mike Daisey made up significant parts of the story. Yes, Mr Daisey fabricated much of his tale about Foxconn Factories. Shameful. “Designed by Apple in California. Assembled in China” sits in fine print on the back of virtually any piece of hardware that Apple ships, be it an iPad, iPhone, or MacBook Air. But have you ever wondered about the second part, the Chinese component? Where these devices are being made in some factory far away, and by who? An episode of NPR’s This American Life podcast aims to answer that question with the help of monologuist Mike Daisey, who wondered “Who makes all my crap?” and then traveled to Shenzen China to find out in an episode called “Mr Daisey and the Apple Factory”. 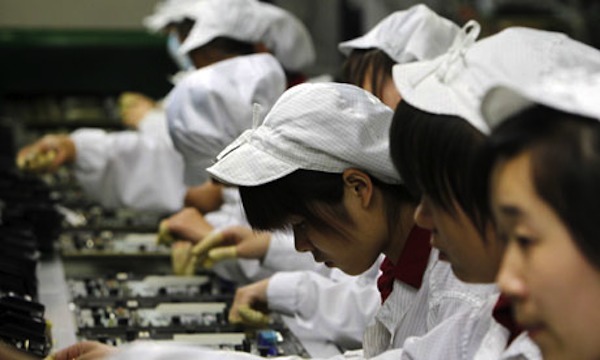 While this episode focuses on Apple products, Foxconn produces hardware for many other electronics companies including Amazon, Microsoft, Intel, IBM, Nintendo, Dell, Samsung, Sharp, Nokia, Motorola, and countless others, and it’s safe to assume the unflattering descriptions of work conditions and factories goes far beyond Apple. This is par for the course with anything manufactured overseas. It was par for the course for everything manufactured at home too before labor laws prevented the abuses that are now occurring in states with weaker regulation and fewer concerns for human rights. This is capitalism at work that nobody likes to think about, whether you like it or not.